The one-off production will be the culmination of a five week theatre project run by the Bravo 22 Company, The Royal British Legion’s recovery through the arts programme, and is being delivered in partnership with the Newcastle Theatre Royal and The Drive Project. 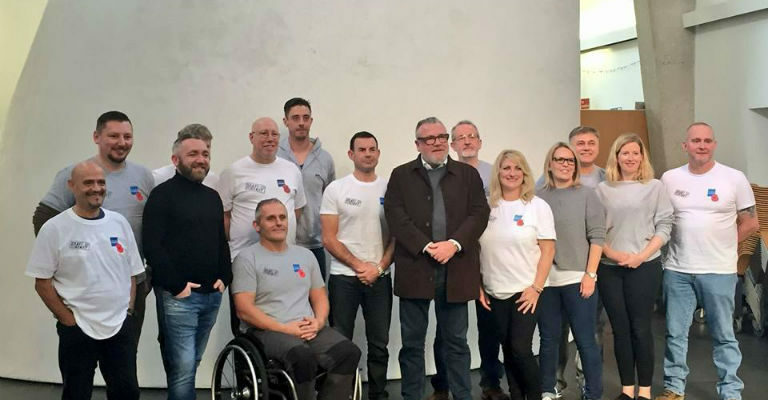 The cast includes veterans who’ve suffered life-changing injures as well as family members with a loved one in the forces. Writer Gary Kitching has based the script on their real life memories and experiences and created a rare theatrical work, a hilariously heart-wrenching tale of love, loss, loneliness and hope. Unspoken follows in the footsteps of several hugely successful theatre and art projects that Bravo 22 company has run over the past six years. Its debut, The Two Worlds of Charlie F, received standing ovations throughout its West End run in 2012 and went on to tour the UK and Canada, including a critically acclaimed visit to Newcastle Theatre Royal in 2014. Furthermore, in December last year, 30 members of Newcastle’s Armed Forces community performed and produced sell-out show Wor Stories at the Theatre, another breathtaking production based on real life experiences. Bravo 22 Company was created by Alice Driver in partnership with The Royal British Legion, the Ministry of Defence and the Theatre Royal Haymarket in 2011 to help improve self-awareness, confidence, self-esteem and motivation in order to aid personnel with individual paths to recovery. Directing the show will be Newcastle Theatre Royal Artistic Director Phil Hoffmann. Most of the cast of Unspoken have taken part in previous Bravo 22 Company projects and one of the stars is former Royal Marine Tip Cullen. After 30 years as a commando Tip left the army in 2015. His first acting break came in Bravo 22’s Boots at the Door in Plymouth in 2015, but he has since gone on to appear in various Hollywood films including Spielberg’s ‘Ready Player One’ and Kingsmen 2. He’ll join this Bravo 22 cast fresh from filming in Canada. Unspoken was commissioned to support RBL’s national campaign of Remembrance, moving into 2018 which marks 100 years since the end of WWI. As such, Newcastle Theatre Royal will be used as a focus for the regional Remembrance campaign which will feed into the national campaign. As well as having official RBL poppy sellers outside the theatre in the run up to the production on the 12 November, a major new art installation will be positioned on the Theatre’s terrace between 25 October – 13 November. Created by award-winning artist Mark Humphrey the sculpture features a 3m tall ‘Centenary Soldier’ standing on a plinth of limestone sourced from the Somme. The figure is inspired by the iconic ‘Unknown Soldier’ in Paris and will provide a centre point for the city’s Remembrance activities. Unspoken is also one of the cultural highlights of Newcastle Freedom City 2017, a city-wide programme commemorating the 50th anniversary of Dr Martin Luther King being awarded an honorary degree by Newcastle University.